In the first part of our blog series we focused myth busting contactless payments. Now we move to the other side of the payment transaction – the Point-Of-Sale (POS) infrastructure point of view where there is growing demand for machines enabled to process contactless payments. In fact, over 50% of the POS terminals are already contactless-enabled and only need to activate the function when the merchant is ready (ABI, 2013). The market for NFC enabled POS terminals is expanding quickly, and is expected to maintain rapid growth through 2019 (Berg Insight, 2015). Payment network operators Mastercard and Visa are pushing NFC acceptance until the end of the decade for all payment terminals. And that means people with NFC-enabled cards and smartphones will have more places to make contactless payments. Also in the mix is the mobile POS (mPOS) sector, a new distinct category of payment terminals experiencing exponential growth. Of particular note is the fact that small and micro businesses, which traditionally are cash-only, are adopting mPOS formats to support contactless payments by card or NFC-enabled smartphone. For example, in the past few years, consumers have purchased fares from many independent taxis, meals from the growing gourmet food trucks, knick-knacks at trade fairs, or even products at a farmer’s market with their cards using an mPOS terminal. These devices are cost-efficient, portable, secure, fast to install, and they’re catching on quickly. Roughly 50 million are expected to be in use by 2018. For online retailers, there’s always been a certain amount of risk associated with accepting credit card payments, because the cardholder can’t physically present the card to complete the transaction. 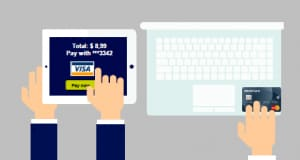 With “tap-to-pay,” your laptop or tablet is equipped with a secure reader module so that you can tap your payment card or NFC enabled smartphone to the device and confirm its presence. With “in-app payment,” your mobile device is equipped with a secure element IC that stores your credentials in a trusted, verified format. Either way, you get an easier method for using your card, as you don’t have to type in any numbers to complete a transaction, and retailers and banks can be more certain that you are the actual owner of the card. The technologies that enable secure mobile payments can be implemented in an embedded module that can then be integrated into just about any device. Imagine a future when payment functionality finds its way into a new generation of applications. Purchase inkjet cartridges from your printer, buy groceries from your refrigerator, pay for a hotel reservation from your car’s dashboard – embedded modules will make it all possible.